She’s so gorgeous! Great photo!! I love these two rich colors together, and the sly knowing look in her eyes. The way she holds her hands together gently and tentatively makes me think that she is compassionate and flexible in life. Wow!! She is glowing with natural beauty! The bag is awesome! 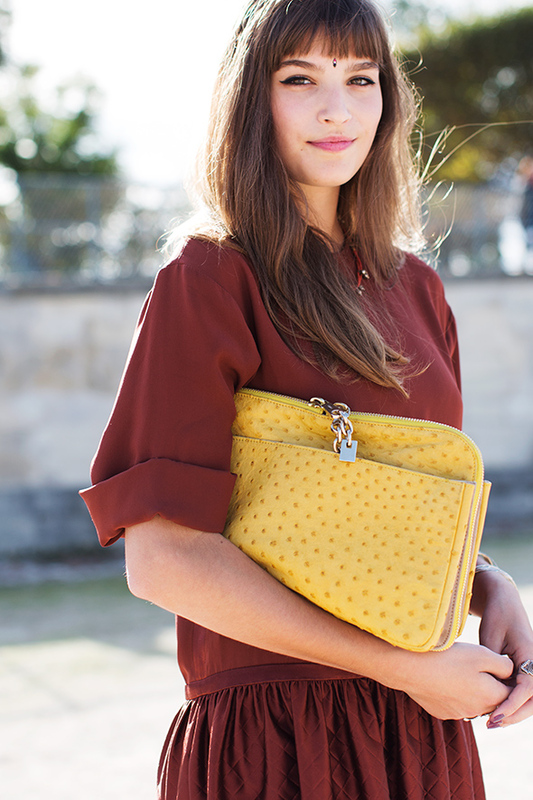 Lovely shot, beautiful girl, great colours, and I like the mustard colour clutch! Love the bag. Nice color. The yellow clutch the gal is holding in the Dec. 4 Sartorialist…can you identify who made it? Is it a clutch of bag for carrying ipad? that hair is a great accessory! Is she wearing a bindi ? I thought I had dropped a crumb on my screen! It is a bindi! It looks like it works for her. Why, yes. Yes, she is wearing a bindi–the forehead decoration. Red, white and blue, even. Smart girl! So cute and so French. The bindi is a subtle, exotic touch! Very unexpected, yet it somehow elevates the whole outfit. Crystalizingly beautiful. She persuasively wears this facial detail. Adorable shot. It was a pleasure and honour meeting you, sir. In the past four days; I went out dressed as a panda; saw a man, lying between two beds of nails, run over by a motorcycle; been arrested; sold new skis to a 5yr old going skiing for the first time, and met, and spoke with a true inspiration and hero. It’s wonderful life. Safe journeys, sir, and all the best to you and yours. i love the silhouette of the dress & the colors! Such a beautiful girl. I love her loose fitting dress and her gorgeous yellow clutch. A smile is the best accessory. She’s got a great one – a mischievous smirk! LOVE it! Love the colors together + her short bangs and perfect eyebrows. Really beautiful! The jewel on the forehead makes her look mysterious and so do the eyes. beautiful colors yet a beautiful lady! great combination of the textured mustard clutch and the burgundy dress. She’s so beautiful. Magical image. Beautiful shot! I love her clutch. What a nice good looking woman! Beautiful photo! Love the little jewel detail! She looks gorgeous! Those colors are lovely together! I have a strange attraction to that bag. Christmas present anyone? Stunning outfitt, and those eyes … ! I love her dress. It’s a dress women love, and (most) men hate. Beautiful photo! We love the mix of colours! Love the outfit on her and the colors fit her so well! She’s a nice girl! good pict! I love the cominbation of the soft colours, the light brown hair, the dark tomato red blouse and the yellow bag. I don t think that photos always have to be super sharp, I especially love the area full of light around her head. Great shot! I can’t understand how this girl, as many other i’ve seen here, can dress like that with such low temperatures! I’d love to; it’s so much easy to dress on summer! But it’s freezing! I never thought of antique rose and soft yellow together, but it’s a great combination as well as the delicate lip and nail color in the same tone of the dress. Beautiful girl. Wow, she looks great and I like her dress and that color. Have a nice day. Wow she is awesome, love the bag! Nice shot, but I hate the cultural appropriation. THANK YOU. I’m glad someone pointed it out. Someone else’s culture is not your fashion. I was wondering when someone would get inappropriately outraged. Gee, how awful. I am sure Scottish people don’t get too outraged when people appropriate plaid for simple decoration, and they took their clan colors very seriously and still do in many ways. So I guess if no one ever cares about plaid, no reason top care about this either. Try living as a brown minority. No it is not ok to take a religious and culturally Hindu symbol and wear it as a white person. Not at all. When white man has oppressed brown man’s religion and culture in a variety of forms, now he is able to take a brown man’s cultural symbol as fashion because it is beautiful and exotic looking? Wonderful. VERY wonderful. I am a brown woman, so you can have that as legitimacy for the outrage. People wear cross designs as earrings and on tshirts all the time, and no one gets too upset about that, even. So if no one cares about the Christian cross having much respect, I don’t see how this is a problem. I have always loved this blog, so I’m really disappointed to see what appears to be a white woman wearing a bindi. This is cultural appropriation, and it is one of the ugliest features of mainstream fashion. I thought that this blog would be above that sort of thing. Ahhhh I must get a Bindi immediately!!!!! She looks gorgeous! Beautiful eye makeup, mysterious and elegant. Of course bindi is very elegant but it’s not a fashion accessory. It has a real meaning and I think it’s quite disrespectful to wear it just to”enhance” a look, especially at a fashion show. She is GORGEOUS! I’m coveting all things prohibition-era at the moment, so her drop waist dress is right up my alley. Awesome color combos too. Great colour combo! Love the photo, beautiful subject! Love the color of her dress !! Beautiful shot! She is stunning and extremely well dressed. Though I am Indian I do not find the bindi inappropriate in any way. This is because except the red/ maroon bindi all other bindis are worn to enhance ones beauty. The red bindi shows the married status of the woman (usually). In southern India the red bindi is worn by women who are married and unmarried (but not widows). But I hope that people are aware of the connection between the third eye and the bindi. I love the photograph and her style. But I wish she had chosen a better bindi. That is exactly the problem with people wearing bindis as a fashion item. There is no understanding of the cultural reasons behind why it is worn. It is also worn in India for beauty, but different bindis have different meanings. I have also, growing up in the states, gotten various comments, several negative, from Caucasians about “the dot,” which I was wearing for religious reasons. I do not respect a Caucasian I see who is wearing it, but I can also understand why other Indians may not be so disturbed. “We’ve been ‘cool’ for a very long time, and in that sense our culture has been taken for a very long time. How do we define when we’ve arrived? It’s not when a young, white girl in Berkley is wearing nice garlands or those nice buddhist beads, or wearing bindi. I don’t feel like my life in anyway has been improved because she has the ability to do that and thinks that’s okay. My life hasn’t improved. The life of my mother has not improved. Our voice as a community within this economic system has not improved. A good friend of mine, she’s south Indian, and she grew up in Connecticut. Her mom would make her wear her bindi and go to school. She would get harassed by kids… she would be harassed so much that what she would do, is that because she was so ashamed to have that bindi on her head, she would leave her house, wipe it off… and then come home and put it back on. To the point where a child would have to think about such a deliberate attempt to refute their own culture I think is pretty profound. If there’s a white girl wearing a bindi walking down central avenue in the heights, she’s not considered a dot head, even though she has a dot on her head. For me, the feeling is disgust and anger. The way I look at it if I see it, I just get so mad because I think, how dare this person be able to wear that, or hold that, or put that statue in her house and not take any of the oppression for that. How dare they. That’s not fair. We have to take so much heat and repression for expressing ourselves. i am indian and let me tell you that this is not cultural appropriation the wrong kind.this is fashion bindi not a religious one.it is made and manufactured to be used as an accessory.you guys just like jumping at nothing.wearing something that is made for religious/ritualistic purposes only is wrong.however this ain’t it.if you adopt something of a different culture into your own style then it helps combat xenophobia and raises more awareness about other cultures. Really like this – it is new. No need for a bindi. She would be equally beautiful and special without it, even more. Love the colours and the yellow ostrich leather clutch. Simple and funky at the same time. The colours she’s wearing go to together almost seamlessly – very funky shot Scott, I fell in love with this one! Love the drop waist dress, the color combo, and the little decoration on her forehead looks cute.